Founded in 1779 by David Simpson, Bowmore is the oldest distillery on the Isle of Islay. Also the probably oldest scotch whisky warehouse still in use, which was build back in the 1700s, belongs to this iconic distillery. So there is a lot of tradition involved and the distillery would have some interesting stories to tell indeed (#fwp). And there are of course the many great whiskies, where some of them even get described as legendary or century milestones. So without further ado, we have a look at Bowmore on Whiskystats. By the time of writing this article, we find no less than 678 Bowmores in our Whisky Database. This brings Bowmore the second place among all distilleries, only behind Macallan with 751 different whiskies. For this 678 whiskies we have 8.331 price observations. The below Bowmore Index consists of the 100 most traded whiskies and includes 3.163 price observations. This index has seen its maximum in June 2015 with around 197 index points. Then, until January 2016, the value of these 100 Bowmore whiskies declined by almost 7%. In the last couple of months though, the index climbed back to 191 points (or equivalently by 4%). This latest index value of 191 points makes Bowmore the 28th (out of 127) highest ranking distillery in our (monthly updated) distillery ranking. Over the past three years, these 100 bottles gained almost 47% in value. This equals 13,7% per year. There are, of course, many independent bottlers who issued the one or the other Bowmore. To be precise, we find 24 different Bowmore bottlers in our database. Beside the distillery itself (for which we find 250 whiskies), it is the Scotch Malt Whisky Society with 91 bottlings which is the most diligent Bowmore bottler. With 76 bottlings, Signatory Vintage takes the second place in this list. On the places follow Cadenhead and Duncan Taylor with 64 and 62 bottlings, respectively. For Douglas Laing we find 45 Bowmore bottlings. All other independent bottlers have less than 30. The 10yo Tempest Batch no.1 is the most traded Bowmore in our database. The 173 price observations distribute over 70 different months. The highest prices observed for this whisky come from ScotchWhiskyAuctions.com for around 200 Euros. Most of the other observations are below or around 100 Euros. We find the second most single price observations for the 16yo (1989) Limited Edition. The 157 trades spread across 74 different rounds of auctions (i.e. months). Since the first price of 57 Euros from back in November 2006, prices climbed by 100 Euros. This equals a 67% increase in price over a nine-year period. The podium of the most traded Bowmores is completed by the Voyage. The latest of the 155 price observation (spread across 80 different months) was also the highest with 237 Euros and came from the last months (April 2016) round of auctions. Chances should be good to still get one of these bottle for less than 200 Euros though. The original three editions of the Black Bowmore are true whisky legends. Distilled in 1964 and bottled in the three consecutive years of 1993 (first edition, 2000 bottles), 1994 (second edition, 2000 bottles) and 1995 (final edition, 1812 bottles) these sherry matured whiskies belong to the rarest and most sought after single malts of them all. Consequently, the corresponding secondary market prices skyrocketed and one or the other fake bottling popped up. The latest price observations for the 2nd and 3rd edition come from the mid and end of 2015 and both exceeded 6.000 Euros. For the first edition we only find three trades. The latest comes from April 2013 for around 4.500 Euros. Notice that there is another Black Bowmore which was issued in the new millennium as part of the Black, White and Gold series. Interestingly, out of this new limited editions only the White Edition made its way to our whisky database since we do not have any price observations for the others. Above you see the price observations for the 2nd Edition. The orange dots label price observations from WhiskyAuction.com, the brown dots those from ScotchWhiskyAuctions.com. To get a better overview on what Bowmores there are, we now have a look at the age and vintage profiles of the distillery. In other words, we simply have a look at how many Bowmore whiskies there are with a specific age or vintage. 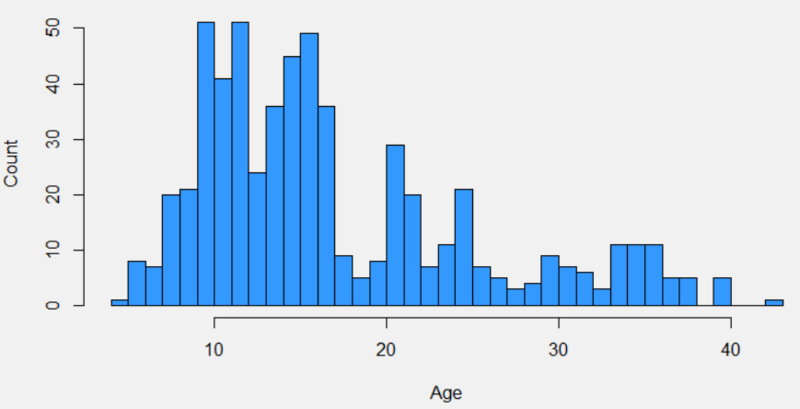 For this purpose, we simply plot the appropriate histograms and interpret the results. The first image shows the Bowmore age profile. Note that you find the bar that corresponds to the e.g. twenty year old Bowmores at the left of the “20” label. We see that most whiskies aged for at least ten years. There are almost 30 Bowmores which aged for 21 years and more than 20 that aged for 25 years. The oldest Bowmore in our database is the already mentioned White Edition. In addition there are 85 NAS (no age statement) Bowmores. The same game can be played for the vintages. Again, the bar that belongs to the e.g. 1990 vintage is on the left side of the “1990” label. The methusalem is the 1956 Islay Pure Malt. An astonishing number of bottles comes from 1989. We count 70 in our database. 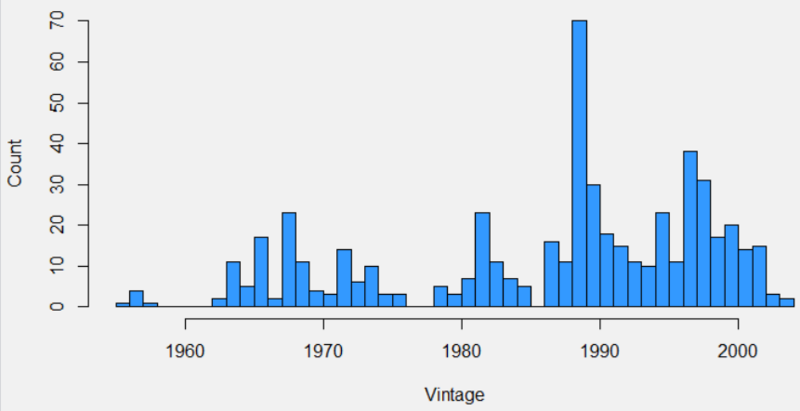 Other strong vintages (in terms of different bottlings) are 1990, 1997 and 1998 with each more than 30 bottlings. In addition there are 142 Bowmores without a labeled vintage in our database. We now look out for those Bowmores with the highest increase in price (no matter how long it took for those prices to climbe). Doing so, we find four bottlings which prices more than quintupled since they first appeared on our radar. On top of this list is the 30yo Sea Dragon. The first price observation comes from November 2005 with 175 Euros. The latest recorded price was 1.215 Euros which equals a 594% increase in price. On the second place follows the 35yo (1966) Cask 3300 from Kingsbury. We only have two price observations for this whisky, 665 Euros from January 2009 and 4.605 Euros from November 2015. The 37yo (1968) Vintage Distillation takes the third place. One of the existing 708 bottles was just recently (April 2016) sold for around 3.600 Euros. The last of the four Bowmores who managed it to more than quintuple its price is the 29yo (1972) Cask 926 again bottled by Kingsbury. A modest 225 Euros had to be paid back in November 2006 to get one of the 218 bottles. Nowadays, you need to be prepared to pay more than 1.000 Euros since the latest price from November 2015 is 1.235 Euros.